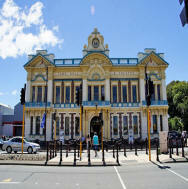 The Civic Theatre is located on Tay St, only a couple of minutes walkfrom the central shopping district of Invercargill. The Venue has been used by the Competitions in previous years and will this year host the Ballet, and Modern Dance in late September. Ballet and Modern dance will be on the main stage. The Stage is a wonderful size for the dancers and the vast number of dressing rooms ensures that there will be plenty of space for the more than 130 competitors over the 4 days. In previous years Vocal and Instrumental have been held at the Civic Theatre in the Victoria Rooms. The acoustics in the Victora Rooms were second to none and the Grand Piano was available for both competitors and accompanists. Repertory House, owned by the Invercargill Repertory Society is only one block east of the Central Baptist Church. Right next to Countdown and well within walking distance from town, Repertory House is a more recent addition to the Competitions Venue list (since it was converted from the St Johns Ambulance Hall several years ago.) Highland & National Dancing and Irish Dancing are the primary events held at this venue. Other events to be held here are Tap Dancing and Speech and Drama. In past years the Song in Character for the Senior and Junior Vocal have also been held at this venue. The venue consists of the main hall/stage (performance area) and changing rooms. Centrestage Theatre, owned by the Southern Institute of Technology and managed by Cue TV. is situated right in the very heart of the city. The 314 tiered-seating theatre is situated on the first floor of the Cue TV building next to SIT Downtown. The theatre boasts a counterweighted fly floor and a full-size stage perfect for dancers. The venue consists of the public auditorium (performance area), foyer, and downstairs dressing rooms.